The 2018 Nissan Versa subcompact sedan is the practical choice if you’re looking for a small-car pricing, fuel economy, spacious, and comfortable vehicle. Nissan is looking at you first-time buyers. The Versa's has a low base price and excellent reliability ratings. The versatile Versa offers a number of trim levels, ranging from the basic S sedan, with its crank windows and manual mirrors, to the nicely equipped SV Special Edition. The 2018 Nissan Versa is a spacious and comfortable entry-level vehicle. Starting at about $12,000 this four-door, five-seater car is gas efficient, fun to drive, and has a good size truck to fit a lot of cargo. So what comes standard? 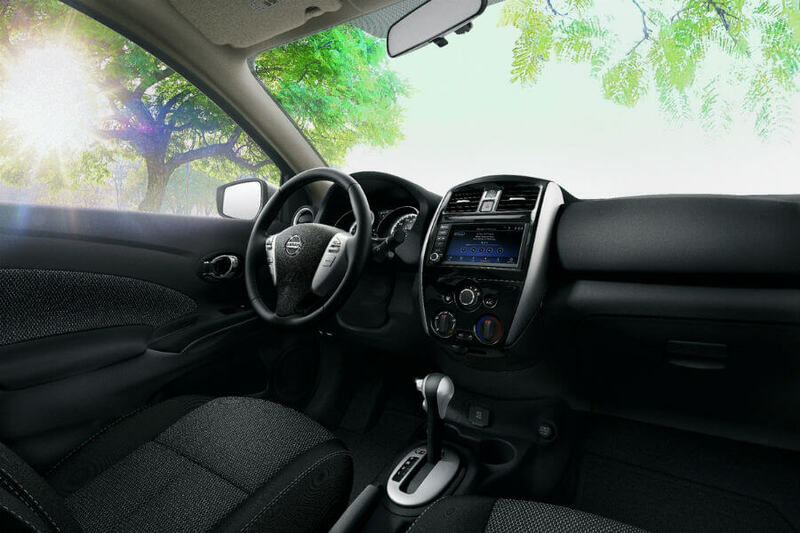 The Versa comes with steering-wheel-mounted audio controls, hands-free Bluetooth phone system, air conditioning, and power exterior mirrors. Those willing to spend a bit more can have a nicely equipped small sedan with such nice features as cruise control, a rearview monitor and 5-inch color display audio. If you’re gifting this car to your college-bound child or keeping this as a second car for commutes, then you’ll you’re going to love the fuel efficiency. It beats its competitors by coming in at 31 in the city 39 on the highway. The Nissan Versa is powered by a 1.6-liter four-cylinder engine. It has soft suspension and delivers a cushioned ride. Road imperfections are absorbed with ease. The Versa has a tight turning radius and is easy to maneuver in confined areas. New to the 2018 Versa are standard adjustable front headrests, map lights, and variable intermittent windshield wipers. Also, deep blue pearl joins the exterior paint palette. The base Versa S comes with 15-inch steel wheels with covers, cloth upholstery, Bluetooth connectivity, and a four-speaker stereo system. Building on the base S trim, the S Plus adds cruise control, chrome exterior door handles, a rear spoiler and air deflectors. On the range-topping SV trim, additional standard features include an upgraded instrument cluster, 60/40 split-folding rear seats, a USB port, and keyless entry. Notable options include the SV Special Edition package, which adds fog lights, 15-inch alloy wheels, a leather-wrapped steering wheel, fog lights, a 5.0-inch screen for the infotainment system, a Special Edition badge, and a rearview camera. Impressively, The National Highway Traffic Safety Administration gave the 2018 Versa a four out of five stars for overall and rollover crash safety. The Versa sedan received four stars for front and side impact safety. The Insurance Institute for Highway Safety awarded both Versa models with the highest score of Good for the moderate overlap front crash test. The Versa seats five people with ample cargo room, and spacious seating. Both rows of seats have plenty of head and legroom. The rear seats are very generous and accommodating. The 2018 Nissan Versa has a massive trunk at 14.9 cubic feet and on the SV trim, it can be expanded with the standard 60/40 split-folding rear seats. The user-friendly infotainment system has an intuitive interface, with easy to reach dashboard controls. Standard features include a four-speaker sound system and Bluetooth. Available features include a USB port, push-button start, satellite radio, and an infotainment system with a 5-inch screen, navigation, voice recognition, and smartphone integration. The Versa’s has quality riding and handling, that is predictable and well composed. Its modest turning radius and comfortably weighted steering make both body styles easily maneuverable around town.